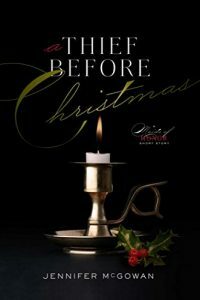 Who better to steal a heart for Christmas than a thief? In this e-short story and prequel to Maid of Secrets, an actress plays matchmaker for two young lovers. It’s December 1558 in England and a new Queen is about to be crowned, but thief and amateur actress Meg Fellowes and her Golden Rose acting troupe are focused on survival, not politics. In between performances of their newest play in the bustling town of Leeds, the troupe is picking the pockets of rich lords and ladies in preparation for their own ragtag Christmas. At the end of each long day’s haul, the troupe’s spoils are divided up, with the useless bits cast aside. But on this particularly cold winter’s night, Meg notices two curious, sealed letters in the discard pile. Together with her roguish troupe master, Meg opens them and discovers they are love letters—never sent—between a merchant’s son and a landowner’s daughter, who do not know of their shared affection. Meg resolves to give the two would-be sweethearts their most hoped-for Christmas wish by returning the letters to the pockets of the intended recipients, not the senders. Can Meg master the role of matchmaker in time for Christmas, or will the young lovers be forced to spend another holiday—and perhaps the rest of their lives—apart?